David Dominé holds an MFA from Spalding University and teaches at Indiana University Southeast in New Albany. His current projects include a collection of linked short stories titled Eating Matches, an allusion to the sad Victorian habit of women swallowing matches as a way to commit suicide. "The Music Box" is one of the stories from this collection. The housekeeper’s head shook back and forth. “I say, stop that now or you’ll stir the warmth right out of it.” She watched her mistress absentmindedly swirl the spoon in the dark liquid, then retrieved the dainty silver utensil and dropped it into the sink. The window in the smoke-stained wall was shuttered tight. Still shaking her head, the stout housekeeper closed the case of smelling salts and returned it to the nearest cupboard. The door into the dining room opened with a loud creak, and the din of restrained voices surged into the kitchen. When the door swung shut, the noise subsided. “How’s the poor dear doing?” A blond head poked into the doorway from the butler’s pantry and studied the dark-haired figure sitting near the stove. “So many people in the house, it’s a wonder it shouldn’t be too much.” The body the head was attached to emerged fully into the kitchen and sat next to the woman on the bench, a hand stroking the black velvet sleeve of her dress. “Sister dear, do you want me to get something for you?” Then she reached up and gently pushed a raven strand of hair out of the woman’s eyes and smoothed the pushed-back veil. The woman with the cup suddenly raised her red-rimmed eyes and attempted a feeble smile. “Brandy.” She took a liberal sip of coffee and looked around. Then her eyes glazed over, and her head sank. The dining room door swung open again, and sound rushed in, followed by a maid requesting another batch of chicken salad sandwiches. The housekeeper pulled out a bottle and thrust it in the direction of the bench before arranging a number of crustless sandwiches on a large silver tray. The servant hurried away once it was filled. After taking the brandy bottle, the fair-haired sister added a generous dose to the coffee. “There, there. It will all get better soon.” She watched as an unsure hand lifted the cup with a slight rattle from the saucer, studied a black jade ring on the finger that grasped the handle. But the other sister, the black-haired one, only emitted a soft whimper and put the cup down without taking a drink. “Coffee’s cold now, that’s for certain.” Muttering, the housekeeper returned the bottle to its spot under the counter. On a nearby table, a stoneware bowl held a mound of dark plums. A scattering of loose peppercorns covered the cutting board where she had set out a large block of cheese with a prune-hued rind. With her fleshy hands, the gruff woman gathered them up and funneled them into a scuffed tin box. “No, I should be quite fine, but thank you.” She smoothed her waist and exhaled. At the opened icebox, the housekeeper glanced over her shoulder and extracted a platter of ham. She watched her mistress rise and try an unsteady step. The cup and saucer tinkled. At the counter, the housekeeper shook her head slowly, but said nothing. The other sister kept the cup close. “No worries, I shall be fine. I prefer to take the back stairs anyway, to avoid all the guests.” She took another step but paused to transfer the cup and saucer to the other hand. “It’s probably best not to go that way.” The housekeeper walked to the stove, removed a pan, and carried it to the cutting board. “The neighbor’s maids were all gathered on the back stair the last I looked, all of them, and they were talking to. . . that woman. A carriage brought her across from Indiana.” Eyes lowered, she began tucking slices of ham into dainty buttered biscuits. “No matter, the front stairs then.” A faint glimmer clouding her pupils, the mistress of the house said it after a sudden, almost inaudible intake of breath. Before anyone could offer resistance, she skirted around the maid, who had come for the ham biscuits, and walked into the paneled butlers’ pantry. Its single window had been shuttered as well, but the barest sliver of light escaped from a crack at the bottom. Ignoring the cluster of bodies in the adjacent stairwell, she reached the door to the dining room in two strides and shouldered it open. The wall of dull sound that met her suddenly subsided, and she hesitated for an instant before pressing on into the sea of black. The guests resumed talking, but in hushed tones. “Thank you, yes. I believe I shall retire for a short rest.” She pulled the coffee cup close and forced a smile. “You are so kind for coming. 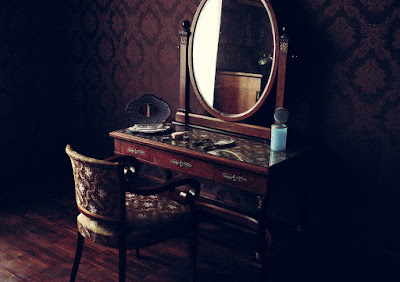 Please excuse me.” At the archway leading into the parlor she stopped, noticing for the first time how the pair of gilt mirrors had been draped with black cloth. A table under one mirror held trays of glazed molasses cookies and elegant chocolates. A man’s hand reached out from the murmur of voices and gently stroked her shoulder. “Again, please accept our condolences.” A female voice at his side echoed the sentiments and added that it had been a lovely day for a funeral. “Thank you so much for your kindness.” The cup began to rattle ever so slightly, and her free hand reached up to steady it. “The Captain was always so fond of you both. Please excuse me.” She moved through the next door and came to a stop at the ebonized piano in the parlor. The sharps and flats of the keyboard had the same lacquered shine as the graceful body. “He was a good man.” A gravelly voice echoed from the other side of the piano as a palsied hand crept forward and stroked the midnight blue shawl adorning the instrument. “Such a shame he hadn’t lived out his full years.” Crepe the color of a bull’s hooves also covered the large mirror on the wall, but an exposed strip of silver captured the worn face that had spoken. A pair of unblinking, cataracted eyes stared. “You’re very kind. Thank you for coming today.” The tang of coffee and brandy wafting from the cup, the mistress of the house watched as a servant unfastened the bottom shutter on the nearest window and opened it an inch to let in a faint stream of air. Alive with swirling dust motes, a shaft of light fell onto the parquet floor. After a nod of the head, the lady moved to the other side of the parlor, where the maid ladled tea punch from an enormous crystal bowl. It perched atop a silver base engraved with two bells joined by a ribbon. Underneath, delicate scroll commemorated a not-too distant date. The cup rattled as the woman gazed at the month and year, but she didn’t set it down. Instead, her grip on the saucer tightened, and she passed through another doorway. “Indeed. I don’t know how I would have managed without you.” The lady of the house laid a free hand appreciatively on her brother’s forearm and then raised it to the jet brooch at her throat. “Please return tomorrow and see me.” On the desktop, an obsidian letter opener lay next to a pot of India ink. She studied the items for a moment and turned to go. In the entry hall, the priest sought the woman out as she crossed to the staircase. She thanked the man, the hem of the cassock brushing the tops of his polished shoes, and listened inattentively to a string of reassurances that her deceased husband had discovered eternal glory. A rosary of onyx beads wound around the cleric’s left hand. Her own wrist trembled from the weight of the cup and saucer, and an elbow began to ache. Beyond the wrought iron grill scrolling across the window in the front door, she had a brief glimpse of the street. A soft breeze flapped a loose end of the bunting on the front porch, and it fluttered back into the shadows underneath. The painted wooden trim had a fresh coat of Charleston green. After several moments, the young widow excused herself and mounted the stair. In the cavernous hallway, her legs weakened, and the cup and saucer began to vibrate violently. She stopped and leaned against a colossal armoire, the blond wood bright against the fabric of her dress. The dark-haired woman pressed her eyes tight and took a shaky breath. Her composure regained, she entered the bedroom and secured the massive door. The window shutters had been thrown back, and light from a cloudless sky filled the room. In the backyard, two noisy cardinals danced in the blooming branches of a waxy magnolia. Stopping before the dresser, the woman set down the cup and saucer. She studied the framed photo of a soldier decked-out in full military regalia as a fragrant breeze ruffled the chintz bed canopy. A tremble shook her upper lip but she ignored it and stared at the image of the man in the frame. Casting a glance over her shoulder, the mistress of the house reached for the ornate music box that stood next to the framed picture of her husband. The music box was a lavish multi-tiered construction of dark wood and carvings with shiny inlay and polished silver gilt. Embedded in the topmost level, a golden cartouche radiated against the black lacquer that surrounded it. About the edges perched an assortment of tiny doves delicately carved in silver, circular in formation, wings rising in different poses of flight as sharp beaks pointed to the scrolling cartouche at the center. She creaked open the top drawer and abstracted a miniature case as a delicate, tinny melody poured forth. Slowly, the young widow opened the tooled oxblood leather lid and studied the empty glass vial cushioned inside the small case. Not quite translucent, a cloudy residue coated the interior of the vial. A smile twitching the corners of her mouth, the lady of the house closed the container after a moment and returned it to its hiding spot in the sumptuous music box. Then she looked down at the cup and saucer on the dresser top. Although the coffee had gone cold, she lifted the cup and emptied it in one long swallow.